A large international team led by Klaas Wiersema from the University of Leicester has discovered circularly polarised optical emission in the afterglow of GRB 121024A. The study, published in Nature, used data mainly from FORS2 on the VLT, but also ACAM on the WHT. The ACAM data allowed the team to correctly identify a break in the light curve that confirmed the long standing prediction that an abrupt change of 90 degrees in the GRB linear polarisation happens when the Lorentz factor of the outwards jet decreases below a critical value. The authors acquired a dozen linear polarisation measurements starting at 2.7 hours after the GRB, and finishing 29 hours later, when the afterglow became too faint for accurate polarimetry. At 3.5 hours after the GRB they acquired a deep circular polarimetry measurement as well. At this time the afterglow light originates from the forward shock of the relativistic blast wave. Theoretical modelling has always predicted a very low level of circular polarisation at optical wavelengths for forward shocks, and far below the reach of the instrumentation. However, the measurements showed the contrary: a circular polarisation of 0.6% was detected. The simultaneous linear polarimetry gave a ratio of circular to linear polarisation of Pcir/Plin~0.15, nearly four orders of magnitudes larger than predicted by models. The nature of this strong circular polarisation is unclear, the authors speculate that it is related to the way electron acceleration takes place in the afterglow forward shock, giving us a first glance at the details of the microphysics inside these highly relativistic shocks. Linear polarimetry provided another surprise: the first confirmation of a long standing prediction that the polarisation angle should show an abrupt 90-degree angle change close to the time that a jet break is visible (the jet break is a break in the light curve when the Lorentz factor of the jet decreases below a critical value). This first detection of a 90-degree angle change relied on the correct identification of a light curve break in the optical light curves. Here the WHT provided its contribution: using ACAM the host galaxy brightness could be determined accurately, and subtracted off the afterglow light curves to reveal a break in the light curves. 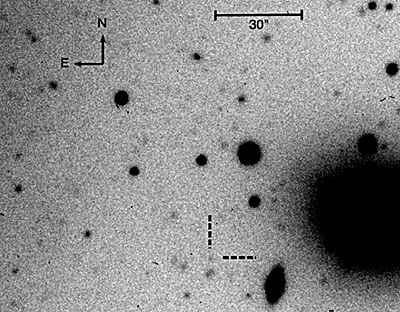 The WHT ACAM Sloan r-band detection of the host galaxy of GRB 121024A. 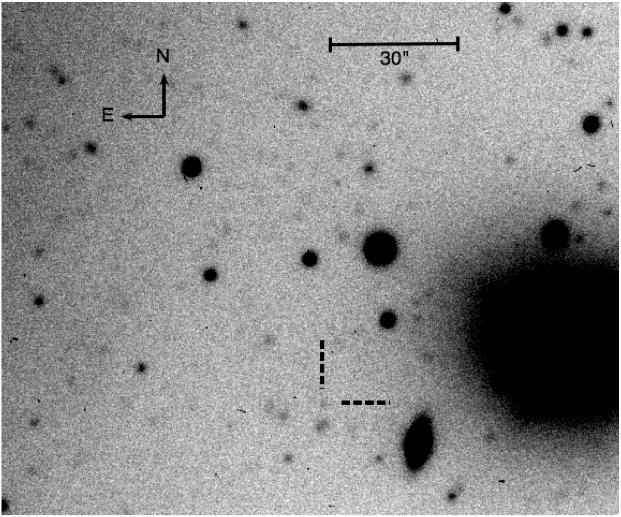 This detection allowed the subtraction of the host galaxy contribution off the afterglow light curve, which showed the presence of a jet break in the data [ JPEG ]. This paper is part of a large effort to better characterise polarisation behaviour in GRB afterglows and similar relativistic jet transients (like jets producing tidal disruption events), with the aim of using statistics of linear polarisation values to determine viewing angle and jet opening angle distributions. The WHT offers a unique contribution to this effort, through LIRIS infrared imaging polarimetry of afterglows, using ToO observations, which has produced several papers already (e.g. Wiersema et al., 2012, MNRAS, 421, 1942). K. Wiersema,	S. Covino,	K. Toma,	A. J. van der Horst,	K. Varela,	M. Min,	J. Greiner,	R. L. C. Starling,	N. R. Tanvir,	R. A. M. J. Wijers,	S. Campana,	P. A. Curran,	Y. Fan,	J. P. U. Fynbo,	J. Gorosabel,	A. Gomboc,	D. Götz,	J. Hjorth,	Z. P. Jin,	S. Kobayashi,	C. Kouveliotou,	C. Mundell,	P. T. O’Brien,	E. Pian,	A. Rowlinson,	D. M. Russell,	R. Salvaterra,	S. di Serego Alighieri,	G. Tagliaferri,	S. D. Vergani,	J. Elliott,	C. Fariña,	O. E. Hartoog,	R. Karjalainen,	S. Klose,	F. Knust,	A. J. Levan,	P. Schady,	V. Sudilovsky	& R. Willingale, 2014, "Circular polarization in the optical afterglow of GRB 121024A", Nature, 509, 201. Paper. "Gamma-ray burst challenges particle acceleration theories", NOVA press release, 30 April 2014. "Shockwave findings set to rewrite scientific theories", University of Leicester Press Release, 1 May 2014.